Posted October 10, 2016 11:08 AM by Anthony Mills. ITS is proud to present the first recipients of the annual ITS Outstanding Customer Service Award. Every year this award will be presented to both a full-time and part-time worker from ITS that has proven to go above and beyond in the field of customer service. 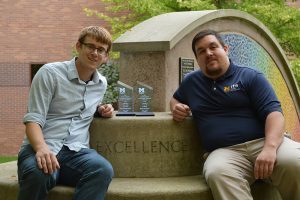 Both recipients hail from the Mediated Classroom Services group. Erik Hoffman is our full-time recipient. Erik has worked full-time for MCS for 4 years and before that worked part time for MCS and NSS. Tyler McPherson is our part time recipient. Tyler has worked part-time for MCS for 2 years. We are very proud of these two and know we can expect great things going forward.